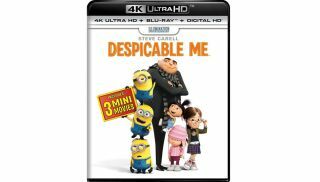 Despicable Me is the first 4K Blu-ray disc with Dolby Vision | What Hi-Fi? The first 4K Blu-rays to come with Dolby Vision HDR are here. But if you were expecting cinematic marvels or blockbuster action set-pieces, you're in for a surprise. The first two discs to utilise the technology are - drum roll - Despicable Me and Despicable Me 2. You know, the ones with Minions in. We have the Despicable Me 4K Blu-ray disc in the office and can confirm that the Dolby Vision logo is on the back of the box. The disc also supports the latest object-based multi-dimensional surround format, DTS:X. What's puzzling is that while the box clearly shows the Dolby Atmos logo, the disc doesn't actually support Atmos soundtracks. It might simply be an error, however, as there's no Atmos logo on the version seen in this Inside CI article. Both Despicable Me films are from Universal, one of the four major studios that have committed to releasing 4K Blu-rays with Dolby Vision - the other three are Lionsgate, Warner Bros and Sony Pictures. Dolby Vision is a version of HDR (high dynamic range) that gives a greater difference between the light and dark parts of the picture. This makes the image more lifelike, and gives it more depth. Despite being available for use in 4K Blu-rays for over a year, these are the very first discs to take advantage of the technology. Other upcoming Dolby Vision discs include Baywatch, The Lego Ninjago Movie, Blade Runner 2049, Resident Evil: Vendetta and Ghost in the Shell.